The editorial for the 2013 JIME special issue on open educational resources (OERs) suggests ‘the benefits of openness can extend to other individuals, communities and organisations beyond [Higher Education]’. Yet even today ‘these are but small steps on a much longer journey of gathering evidence, sharing experiences and changing expectations’ (Lane, Comas-Quinn and Carter, 2013). This paper is our contribution to this journey by offering a case study of extending the benefits of OERs into a corporate environment. We adapted an open digital storytelling course, DS106, as it is taught on the web in a higher education context, for use within 3M corporate spaces. Our learning approach is a ‘salon model’, named after the ‘penny universities’ established in coffee houses during the Renaissance (Peter & Deimann, 2013) as physical open education environments. The salon model is being tested at 3M as a way to bridge the gap between mainstream corporate training and learning on the open web by exploring a middle layer of open that we define as the ‘open organisational web’. It provides a layered approach that supports an ‘open’ pedagogy with the aim to encourage creativity and innovation through community building, collaboration and increased global communication skills. As the originator of the “15% Time” model in promoting development of innovative products (Goetz, 2011), it is not surprising 3M supported this experiment in workplace learning. We refer to our initiative as the ‘3M-DS106 Salon’ in the remainder of the paper to distinguish it from the open online course DS106. DS106 – What is it? The open digital storytelling course, DS106, began in early 2010 as a computer science course at the University of Mary Washington (UMW). Students manage their own digital domain as they learn to understand storytelling and create different types of digital media. Influenced by other efforts elsewhere in running open online courses, in 2011 DS106 expanded to integrate a global community of open participants. Its design is distributed. Participants publish and reflect on their work in individual blogs and social media sites; the course site subscribes to these sources, aggregating individual work together. DS106 is an open online course, but not massive as popularized in the media (Pappano, 2012). As such, it is not a MOOC (Massive Online Open Course) but more an “OOC” (Levine, 2013a; Groom & Burtis, 2014a). Groom & Burtis sum up the ethos of DS106 when they advise: ‘don’t get distracted by the massive; invest in community’. A typical DS106 course explores issues of digital identity, intellectual property, elements of storytelling, and creative expression in the form of visual, design, audio, video, and remix, plus the web itself as a platform for stories. All participants are expected to create media, to critically reflect on the ideas behind their work, and to share details of its production. An example of how open pedagogy is used within DS106 is the Open Assignment Bank: a participant generated collection of over 600 creative tasks (DS106 (n.d.). Stacey (2013) characterizes it as a ‘hugely significant pedagogical innovation.’ Besides offerings for UMW classes, DS106 is designed to allow educators of similar courses at other institutions to have their students publish work openly in their own blogs and connect their class to the DS106 site. To date, this has included courses at Jacksonville State University, Kansas State University, Kennesaw State University, University of Michigan, St. John’s University, SUNY Cortland, Temple University Japan, and York College (CUNY). Participant content is syndicated into the DS106 ‘flow’. Between January 2011 and July 2014 the site accumulated over 33,000 blog posts written by some 2900 unique participants. The open, overlapping DS106 environment is a network, defined by Johnson (2010), as one where individuals can become both smarter and more productive. Whilst we only have anecdotal evidence of how individual students benefit from an open pedagogy, narrative accounts consistently indicate how participation has significantly impacted their experience as illustrated in the quote below by C. Hendricks, a DS106 open-online participant. As guiding principles, McKnight’s progressive management theories provide the foundation for an innovation-based culture. Perhaps the most well known outcome is 3M’s strategy of encouraging employees to spend 15% time of their work time on their own projects. 3M believes that this freedom to explore is critical to developing new ideas and solving problems. In a culture driven by the creative exchange of new ideas, employees use their 15% time along with 3M’s resources to build teams and to follow their own insights in problem solving. The idea is well established both practically (Goetz, 2011) and in management theory (e.g. Morgan, 1994) and has been deployed at other companies such as Google. Out of the McKnight Principles the 3M Technical Forum (12,000 plus global members) was founded in 1951 to foster communication across a diverse technical community enabling innovation to flow within the corporation. The 3M-DS106 Salon was initiated here. A majority of the participants in the 3M-DS106 Salon were members of the 3M Tech Forum described in the previous section. In our first iteration 18 technical employees located across the US followed the online 3M-DS106 Salon, 12 participated at some level, and 8 completed assignments documenting their work with blog posts. In what follows we will be using further participant quotes as anecdotal illustrations for our reflections. The section on future work at the end of the paper will outline our intentions for next steps as we incorporate a more rigorous approach to data gathering. The initial 3M-DS106 course structure included a weekly focus topic with weekly meetings scheduled over lunch to discuss assignments, which were done independently using 3M blogs as communication tools. Similar to the weekly class structure offered in the UMW DS106 course, 3M-DS106 salon gatherings were hosted in a traditional conference room at the 3M headquarters in St. Paul, Minnesota. Web meetings and other interactive digital communication tools, although confined to those available internally, were also utilized to allow remote members to participate in real-time and asynchronously. Our assumption was that the pedagogy and assignments of the DS106 open course could be modified and made available within a corporate environment, using creation and communication tools available internally to all employees. However, interacting with media on the open web can run the risk of content not being appropriate for all audiences (see Lockridge, 2013f for discussion). To mitigate this risk and in order to provide a layer of safety between the open web and 3M corporate needs, we edited and customized assignments from DS106 and re-published them on the 3M intranet, monitoring for content appropriateness. Non-proprietary activities were then shared back to the open DS106 community with permission from the participants. (Figure 1: Lockridge, 2013d). 3M-DS106 Salon Wall Walker GIF created by salon participants. (Lockridge, 2013d). Participant blogs record their gains in media expression and an evolving reflective practice. In narrating their process, they affirmed value in giving and receiving feedback via comments, developed greater capacity for relationship building and more comfort in using creative tools and 3M’s social networking platforms. Overall, they stated an increased effectiveness for communication and technology transfer in their organisational setting. In the 3M-DS106 Salon a specialist facilitation role, we refer to as the ‘Salon Patroness’, acts as a supportive network connector both within 3M and outward to the open DS106 community. The first author of this paper, Rochelle Lockridge, a fulltime employee at 3M since 1990, is acting as the patroness or host of the 3M-DS106 Salon. We believe this role requires full membership of both communities and hence Lockridge had fully participated in the open DS106 during the summer of 2013 before bringing it into 3M. In post course recorded interviews, participants identified a need and interest in integrating the course experience into their technical work. They identified using tools in real time on 3M related projects within a community of learners as a highly effective practice. It’s been great to do it in conjunction with 3M systems so that I can immediately apply it to my job. Each of us took away a different part… but it all needs to be there because you just never know what thing might spark something and somebody else that ends up being a crucial point to their job. - 3M Engineer (Lockridge, 2013a). To see them use, especially in the DS106 area some of the technology like blogs and videos and animated GIFs was very impressive to see how quickly they went from not really using the software… to using it and feeling comfortable providing comment on how they used it. From that perspective I thought it was a very successful training session. - 3M Technical Collaboration Chapter Chair (Lockridge, 2013a). Digital storytelling in this salon style seems to offer an opportunity to investigate a subject matter as it brings together creation of artefacts with public learning about a craft. Research suggests that the approaches of action learning (Revans, 1998; Pedler, 1974) are more likely to generate key workplace competencies than more traditional classroom based ones (e.g. Malone, 2013). Yet we see limitations, as participants to this course were self-selected; could it be that those who did not welcome the approach simply did not sign up? 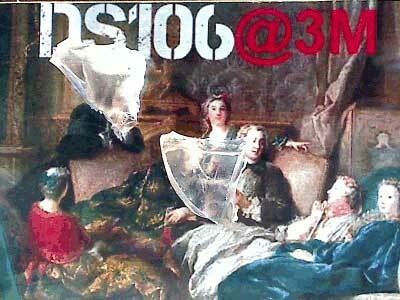 3M is now sponsoring a yearlong 3M-DS106 ‘course’ in 2014 to provide participants more time, flexibility and practice with a monthly topic focus. This second iteration is also intended to incorporate more communication and collaboration tools specific to the 3M environment. 3M-DS106 2014 was launched in February as reported in a presentation at the OER14 conference (Lockridge, Levine & Funes, 2014). Fifty 3M employees across functional (technical, business, finance, HR) and geographic boundaries (US: Minnesota, Texas, California; UK, Austria, Norway and Germany) expressed an interest in participating. Meeting attendance is averaging five participants. The participants themselves, however, vary. Only five overall have produced content with the patroness viewed as the connector and often the subject matter expert. Moving away from the weekly assignments in the DS106 model, the second iteration proposed a more leisurely monthly topic focus. Weekly 3M-DS106 Salon gatherings over lunch provide a regularly scheduled time where participants come to learn and share their experience in real-time about a digital communication or media topic such as creating better PowerPoint presentations, using a wiki, or how to create and edit a video. The meetings are seen as positive and used by participants to learn new skills, offer feedback and generate ideas about how to improve content shared by others. Yet, to date this has been largely driven by content produced by the patroness. We observe that this iteration of the 3M-DS106 Salon is being used more as a seminar discussion group than a hands-on experiential workshop. The authors have had several conversations about our choice to run this second iteration with a monthly focus rather than weekly topics. We made this choice based on 3M participant feedback that more time was needed to complete assignments. This may have contributed to the change of emphasis away from content creation and towards discussion. We note that literature on communities of practice (Wenger, 2010) may help throw light on this observation. According to Coplin, ‘default open cultures’ generate the environment needed for innovation and creative thought. Yet workplace culture is typically a ‘default closed culture’ (Coplin, 2013). He believes that organisations could become significantly more competitive if they implemented what he terms ‘default openness’. Like many corporate organizations 3M wants to encourage greater transparency and openness internally with a view to nourish innovation and creativity. Our 3M-DS106 Salon model incorporates the idea of ‘an open organisational web’ facilitated by a network connector who brings together the organisation and open educational resources (Figure 2). We see this approach as a viable first step in creating a default open mind-set providing a layer of safety both for the organisation and the individual. ‘A DS106 Thing Happened On The Way To The 3M Tech Forum’ by Giulia Forsythe. We have noticed a further difference with the monthly focus in this second iteration. Participants are more hesitant about completing assignments. Iteration 1 had participants posting more content in the open organisational web. To encourage participants to publish more, we are actively role modelling the importance of ‘showing your workings’ and ‘taking risks’ to increase organisational collaboration and innovation. One example of this is the publication of a blog post entitled ‘Sharing to Learn – Learning to Share’ where these issues are being explicitly discussed (Lockridge, 2014). In essence, participants are encouraged to take the risk to ‘share to learn’ by observing the patroness taking the risk to create and ‘get herself out there’ for feedback. We do not yet know why participants are showing more hesitancy in publishing their work. Time may be a factor in giving participants more reflection time and making them more aware of the potential risks of publishing their work within the ‘default closed’ corporate culture. Reflections from a current participant provide some support for this idea; upon discovering that she had published a blog post with one spelling mistake she has not published again. We take on board for further exploration a reviewer’s comment that this reflective approach may not be suitable for all audiences. DS106 pedagogy encourages the role modelling of vulnerability on the part of the educators (Groom & Burtis, 2014a). The salon patroness, as embodied in 3M-DS106, is vulnerable in this context; both out in the open web and inside the open organisational web. This helps participants develop trust to try out potential applications of what might at first seem unrelated to their day-to-day work (e.g. the creation of an animated GIF - Lockridge, 2013c). Pedagogically, we note that the patroness’s approach to writing her blog posts may be key to narrating the learning process and adapting open web content to the organisational culture. After meetings she publishes posts that summarize the meeting and the learning, discuss key processes, and offer resources about a given topic. Most significantly, she models what it means to work in a collaborative and open manner. She does this by sharing the work of all participants as this builds a network over time. She links to their work and personal profiles, listens to participants and makes introductions when participants who may be able to support each other’s work do not know one other. In essence, the digital media creation is secondary to teaching the literacies needed to support the creation of ‘openness as a state of mind’ (Weller, 2010). Pedler (1981) describes a ‘trainer as stranger’ role in a learning community facilitator. He argues that detachment enables the asking of difficult process questions. Our work suggests a difference in the online space. By nature of its technological modality, virtual learning communities are detached. Our experience suggests a less detached ‘stranger’ role to avoid members feeling unsupported. This seems particularly relevant when the course runs for a longer period of time to counteract the fear to publish that appears to arise for some participants. An explicit pedagogy that encourages educator vulnerability and full belonging to the communities being connected may be the essence of our 3M-DS106 salon model’s innovation. Lockridge is not a consultant but a full time member of the organisation; her presence generates a sense of belonging for all in the community as communicated by 3M engineer L. Beck. This is aligned to what Brown and Katz (2009) suggest when they say that ‘we need to invent a new and radical form of collaboration… it’s not about ‘us versus them’ or even ‘us on behalf of them’ […] it has to be ‘us with them’.’ We need to do more work to elicit the detail of key literacies needed to be an effective educator in this particular role. Important here seems to be the willingness to take that first step to publish and get feedback as we saw earlier. It may be that the patroness role mitigates against the detachment some can find when learning on the open web. Boyatsis (2002) has studied self-directed learning in organisations and concludes ‘adults learn what they want to learn’. Using the 3M-DS106 salon model for bringing DS106 or other online open courses into an organisation may also be a way to achieve a more self-directed learner in the organisational setting. Pedler (1981) explores the nature of community and the role of facilitation to engender an environment that allows self-direction. They suggest that ‘designing freedom to learn is a challenging task’. Designing freedom to learn online seems even more challenging. In their paper they also note two key qualities for learning communities: that each member is responsible for identifying and meeting their own needs and that they are responsible for helping others identify and meet their needs. They add that members are also committing to offering themselves, as a ‘flexible resource’ in the service of others’ needs. We believe that the DS106 open community meets these criteria and also found these qualities spontaneously emerging within the 3M-DS106 Salon community. We propose that by placing ourselves in a situation of structured serendipity, such as open communities, we increase the potential for this to happen because it is a place where it can occur on an ongoing basis. Perhaps by acting in the open mindset, e.g. sharing work more openly, connecting and commenting on the work of others, learning about and contributing ideas to projects outside one’s field, by doing things that in general that create a potential energy for serendipity or happy accidents to occur, we are seeding ourselves with ideas that cannot but help provide fuel for the work we do down the road. We hope that by adapting DS106 to workplace learning, assuming we can overcome some of the barriers discussed in this paper, we can encourage structured serendipity and bridging as key creative literacies that underpin the idea of a default open culture for innovation. Once this iteration is complete we will be able to make more meaningful comparisons between iteration 1 and 2. We also want to talk to the people who were invited but did not participate. Is there something in the nature of the ‘open learning’ approach this paper has suggested that prevented these people from joining? We are grateful to our reviewers for bringing to our attention concepts that could be explored more fully, and for opening up the potential for a comparative study between participants and non-participants to explore suitability to our Salon approach. We hope to build our findings into iteration 3, which is already being planned at 3M. The 3M-DS106 Salon has generated an increased level of dialogue within 3M about the DS106 course and what it is bringing to the organisation. We see a clear connection between the work we are doing and the larger organisational system focussing on the complexity of evolving toward a ‘default open’ culture. In spite of the challenges, we have seen potential for DS106 being deployed within an open organisational web. Yet as the 3M-DS106 Salon grows, it poses increasing demands on the patroness to role model open behaviours and adapt to internal enterprise software platforms that are not as flexible as those available on the web. Recognizing the importance of social media to collaboration and innovation, 3M is bringing in a specialist in these issues to provide guidance. This may help us address some of the technical and pedagogical limitations to our approach. Groom & Burtis (2014a) acknowledge that DS106 may not be for everyone. They tell their students ‘you are going to be in the open and if this does not gel, then maybe it is not for you.’ The suitability of participants (see Funes, 2013 for preliminary ideas) is something we will be tracking with interest in future iterations. 3M Company. [3M] (n.d.). The McKnight Principles. Available February 24, 2014, Available from: http://solutions.3m.com/wps/portal/3M/en_WW/History/3M/Company/McKnight-principles/. Boyatsis, R. (2002). Unleashing the power of self directed learning In: Sims, R. R. ed. Changing the way we manage change. Westport, CT: Quorum Books. Brown, T. and Katz, B. (2009). Change by design: How design thinking transforms organizations and inspires innovation. New York: Harper Business. Coplin, D. [The RSA] . (2013). RSA Animate - Re-Imagining Work, September 25 2013 [Video file]. Available from: http://youtu.be/G11t6XAIce0. DS106 (n.d.). [website] Available from: http://ds106.us/ [Accessed February 22, 2014]. Funes, M. (2003). Buijs, Jon, van der Lugt, Remko; Remko and van der Meer, Han Han (eds. ), Bridging: The Essence of Creativity. Proceedings of the 7th European Conference on Creativity and Innovation. Funes, M. (2013). No! You should not do DS106. August 9 2013 [Blog post]. Available from: http://mdvfunes.com/2013/08/09/no-you-should-not-do-ds106/. Goetz, K. (2011). How 3M Gave Everyone Days Off and Created an Innovation. February 1 2011 [Blog post]. Available from: http://www.fastcodesign.com/1663137/how-3m-gave-everyone-days-off-and-created-an-innovation-dynamo. Groom, J. and Burtis, M. [Tom Woodward] (2014a). Open VCU - Jim Groom and Martha Burtis. February 21 2014a [Video file]. Available from: http://www.youtube.com/watch?v=WAD37VUW_j4&feature=share. Hendricks, C. (2013). Rapping, scratching and popping the Headless week 4 audio. October 2013 [Blog post]. Available from: http://ds-ina.tumblr.com/post/62220351049/headlessweek4audio. Idea Finder. [Idea Finder] (nd). Fascinating facts about the invention of Scotchgard™ by Patsy Sherman and Sam Smith in 1956. Available from: http://www.ideafinder.com/history/inventions/scotchgard.htm. Ito, M. (2014). Trust Falls and My Whys for Connected Courses. [blog post] Available from: http://itofisher.com/mito/weblog/2014/10/trust_falls_and_my_why_for_con.html. Lane, A., Comas-Quinn, A. and Carter, J. (2013). The potential of openness for engaging communities. Editorial - JIME OER13 Special Issue, Available from: http://www-jime.open.ac.uk/jime/article/viewArticle/2013-14/html. Leary, W. [The Newyork Times] . (2002). The Inquiring Mind Behind 200 Years of Inventions. October 22 2002 Available from: http://www.nytimes.com/2002/10/22/science/the-inquiring-minds-behind-200-years-of-inventions.html. Levine, A. (2013a). Ds106: Not a Course, Not Like Any MOOC. Educause Review, January 28 2013a Available from: http://www.educause.edu/ero/article/ds106-not-course-not-any-mooc. Lockridge, R. [Rochelle Lockridge] . (2013a). 3M DS106 Is Open For Business, February 24 2013a [Video file]. Available from: http://youtu.be/sfF_LqHLKY0. Lockridge, R. (2013b). DS106 Invitation to 3M. August 18 2013b [Blog post]. Available from: http://rockylouproductions.com/blog_wp/2013/08/18/3m-ds106_invitation/. Lockridge, R. (2013c). Gifs, Gimp and Me (3M-DS106 Repost). October 2 2013c [Blog post]. Available from: http://rockylouproductions.com/blog_wp/2013/10/02/gifs-gimp-and-me/. Lockridge, R. (2013d). Modifying DS106 to Work at 3M. October 9 2013d >[Blog post]. Available from: http://rockylouproductions.com/blog_wp/2013/10/09/modifying-ds106-work-3m/. Lockridge, R. (2013f). What did I do in Week 2?. September 9 2013f >[Blog post]. Available from: http://rockylouproductions.com/blog_wp/2013/09/11/what-did-i-do-in-week-2/. Lockridge, R. (2014). Sharing to Learn – Learning to Share. June 24 2014 [Blog post]. Available from: http://rockylouproductions.com/blog_wp/2014/07/06/learning-to-share/. Lockridge, R., Levine, A. and Funes, M. [Rochelle Lockridge] (2014). A DS106 Thing Happened On The Way To The 3M Tech Forum, July 8 2014 [Video file] Available from: http://youtu.be/rzU6vK4AEsw. Malone, P. S. (2013). The Untapped Power of Action Learning. August 8 2013 The Untapped Power of Action Learning. Available from: http://www.astd.org/Publications/Magazines/TD/TD-Archive/2013/08/The-Untapped-Power-of-Action-Learning. Morgan, G. (1994). The 15% Solution. Imaginization: Provocative Ideas, Available from: http://www.imaginiz.com/provocative/concept/solution.html. Pappano, L. (2012). The Year of the MOOC. The New York Times, November 04 2012 Available from: http://www.nytimes.com/2012/11/04/education/edlife/massive-open-online-courses-are-multiplying-at-a-rapid-pace.html?pagewanted=all&_r=0. Pedler, M. (1981). Developing the learning community In: Boydell, T. and Pedler, M. eds. Management self-development: Concepts and practices. Farnborough, Hants, England: Gower. Revans, R. W. (1998). ABC of action learning. London: Lemos & Crane. Stacey, P. (2013). The Pedagogy Of MOOCs. May 11 2013 [Blog post] Available from: http://edtechfrontier.com/2013/05/11/the-pedagogy-of-moocs/. Weller, M. (2010). Openness at the OU. Slide 17, Available from: http://www.slideshare.net/mweller/fiji-ou-5961599. Zweig, J. (2011). Structured Serendipty. THE WORLD QUESTION CENTER, Available from: http://www.edge.org/q2011/q11_2.html - zweig.